People who eats chilli with everything have poor appreciation of food. Chilli is so overpowering that it numbs the tongue and all you taste is chilli, drowning the flavour of the food you are eating. Singaporeans are well know for their love of chilli. You see people pouring chilli sauce from the bottle on whatever they have been served and this tells you that are not a connoisseur. Diners have been turning up in droves for the famous Kin Kin Chilli Pan Mian at 534 Macpherson Road, since it’s Singapore branch opened two weeks ago. It is best to add the special dry chilli flakes to the noodles, and mix all the ingredients together. The signature dry ban mian costs $5 a bowl. 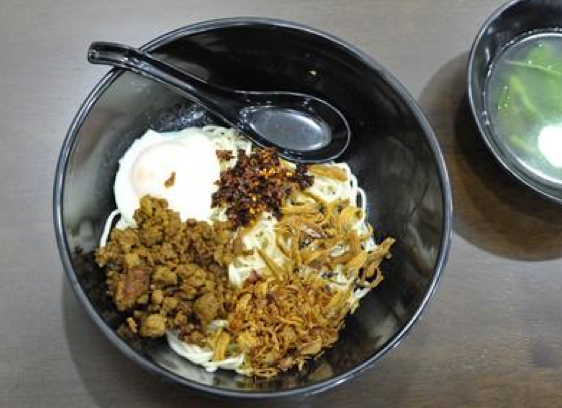 via Long queues form in S’pore for KL’s Kin Kin chilli ‘ban mian’. This entry was posted in Life and tagged Chilli, chilli sauce, Kin Kin Restaurant, Noodles, Pan Mian, Restoran Kin Kin. Bookmark the permalink.